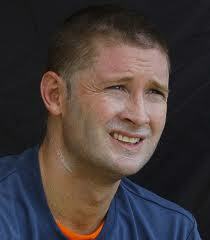 Michael Clarke, the Australian captain, searches for victory. While our baseball friends in the U.S. huddle around their stoves and await the first sprigs of spring training to appear in February, cricket lovers are enjoying a sun-drenched, beer-fueled banquet of competition in the southern hemisphere. After an inconclusive (if competitive) series of matches against Australia, South Africa are now playing the well-matched Sri Lanka in South Africa. South Africa are currently one up in the three match series. Meanwhile across the Indian ocean, the Australians (after a fairly indifferent showing against New Zealand) are battling India, in a much anticipated battle between aging titans. This time last year, Australia was being dismantled by England, a feat that England repeated six months later against India. So, both Australia and India are wounded and have something to prove. England meanwhile (newly named BBC Team of the Year) next month go to the Middle East to take on a Pakistan side that had a very successful 2011, and shows every sign of having put its tawdry and torrid 2010 behind it. So all you baseball fans: Turn your hungry eyes further south than Florida and enjoy the feast of bat and ball taking place around the Tropic of Capricorn. This entry was posted in Australia, Cricket, England, India, New Zealand, Pakistan, South Africa, Sri Lanka, Test Cricket. Bookmark the permalink.